New here? We've got you covered, with the greatest number of classes for beginners and stretching professionals alike. 1. Are you intimidated about barre, yoga, acro, or all of the above? Our Honorary Membership is available to new members for a full 30 days of honorary access to the studios, in which you can get a taste of what it's like to be a PSY Monthly Member! Pop in anytime and give our classes a whirl for a special, ultra-low rate — without being locked into an auto-pay commitment. 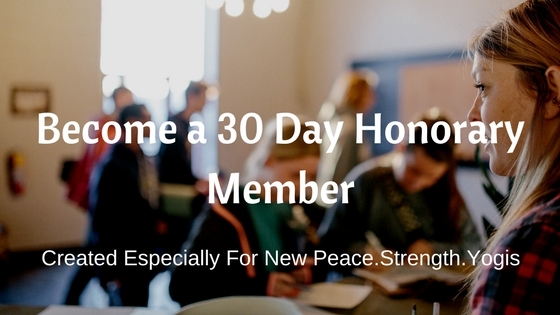 Just a straight 30 days of peace the moment you walk through the door. Each of these classes are put in order of difficulty. From just laying on the floor to more movement. This class is great for all leveled yogi's. It is perfect for the "during commercial push up enthusiast" all the way to the most elite athletes! As we guide you through series of highly effective stretching exercises, you will realize (very quickly) this is the class was what you were missing in your training regime. This class is based mostly on the floor. If you are hoping to take it slow and really connect your breathe to your body, this is the class for you. Open to all leveled students, this class is more about quieting the mind with soft music, and using props to open the body. Great for all leveled yogi's. This class is based mostly on the floor. If you are hoping to take it slow and really connect your breathe to your body, this is the class for you. Open to all leveled students, this class is more about quieting the mind with soft music, and using props to open the body. Take out your journal and let go of anything and everything on paper. This is a safe place for you to enjoy a different way to release and be present on your mat. Great for all level Yogis. Yin Yasana is a mindful combination of Vinyasa flow and Yin Yoga. Class begins with pranayama (breath work) and the slow awakening of the muscles within the body, then continues through a beginner level vinyasa flow. The second half of class focuses on letting go and sustained holds in poses targeting hips, hamstrings and the lower back. Leave feeling balanced and restored! This class will move through basic yoga poses, building core strength and flexibility in order to continue to advance in your practice. We will concentrate on improving our alignment safely, as well as connecting our breath with movement. Great for all leveled yogi's. This class allows students to work mindfully in their practice, focusing on alignment based flow that aims to skillfully build strength, balance, and supported posture, and endurance. Free parking can be found on St.Elmo Ave, and around the building. advance via your online account. will result in the loss of the class and you will be charged as attending. I’ve stretched and sweated with Kaylee for about a year now, and I will say, that her program has changed my quality of life. The weekly yoga sessions, as well as practicing on my own, not only completely alleviated my neck pain, but also increased my flexibility and rock climbing ability as a result. I’d say she’s one of the best teachers I’ve ever had. She brings unbridled enthusiasm to every class, as well as a weirdly endearing sense of humor, solid tunes, and lots of smiles. Beautiful space. Wonderful teachers! This new studio is full of love. I’m hooked. Baby steps are exactly how I end up climbing a mountain, and I’ve been able to take those steps here! I have enjoyed the Wednesday morning Yin class a few times and I’m not stopping! My first visit to PSY and I’m in love. Kaylee led a beautiful Rise & Flow class this morning that was just what I needed. After I just wanted to snuggle up on the couch with Mia and enjoy the ambiance of the studio. I will definitely return and explore all the other options this fantastic studio offers.